My 9 best solo cruiser tips and advice, plus a bonus! You can find dozens of articles online written by people who have completed their first solo cruise. I enjoy their stories, but one solo cruise does not an expert make. Not to say that I’m an expert, but I’ve really been there, done that and have been buying the proverbial t-shirt since 1979. My first solo cruise was a three-night trip to the Bahamas. I was hooked. Now 40-years later, here are my insider solo cruise secrets to get you on your way to cruising solo. 9 Top Tips for your first time cruising solo. Plus a bonus tip! 1. Board the ship with a smile. The Queen Mary 2 welcome aboard team makes you feel at home. Even if you’re not the most intrepid traveler and have a string of doubts about cruising solo, hold your head high and act like you belong there. Why? Because you do! Traveling solo is not a dreaded condition nor should it be perceived that way. Smile to the welcome aboard staff, to fellow passengers in the elevator and even at muster drill. It’s a good way to get your solo cruise off to a great start. 2. Get to know the front desk staff. As a solo cruiser, I made it a point to get to know the front desk staff aboard Holland America Eurodam. Except for after midnight, during dinner and show times, the front desk staff can be bombarded with guests, many of whom are there with unfounded complaints and unreasonable requests. Don’t be like the rest of the herd. A little kindness goes a long way. If you should need special assistance with anything, the front desk staff is your first stop. So it makes sense to be pleasant and polite. Show your appreciation with a box of chocolates from the gift shop. Or stop at a bakery at your first port of call and bring back a sweet treat for the front desk people. A little kindness goes a long way. 3. Make friends with a bartender. Ladies, listen up. Here’s a “trick” I figured out several years ago. After the muster drill or when the evening bartenders start their shift , I scout out a bar that looks comfortable, has wifi and where the bartender seems to love his/her job. My goal is to find my own “Cheers” for the duration of the cruise. Completing my bar-trials, I settle in on what I call my comfort zone. I’d look for this Celebrity Edge bartender later on in the cruise. When the bartender serves my drink, I tip a $20 bill or the equivalent in Euros. A conversation ensues. It’s nice to have a place to go for a drink without being bothered by sloppy drunks or overly chatty bar-flies. My new bartender-friend has my back. I don’t want to spend sea days in my room and now I can sit at this bar, type, people-watch, sip and relax without un-wanted interruption. 4. Take an onboard class. Hands-On cooking class at the Culinary Center aboard Holland America Maasdam. From Apple computer and dance lessons to culinary demonstrations and acting classes, there’s something for everyone. Holland America Line and Oceania have hands-on cooking classes. Wine, martini and/or whisky tastings are offered by almost every cruise line and are a sure way to meet your fellow passengers. 5. Sign up for the ship’s shore excursions. Hop on a bus or walk a short distance with other cruise passengers to the destination is an excellent way to get acquainted in a hurry. Especially if you are headed for a afternoon party boat cruise! There are excellent, independent shore excursion providers to use, too. Sometimes a long motor coach ride yields all sorts of new friends. One thing I will note, however, on a Caribbean cruise, you might find more solo people from your ship going with the cruise line’s excursions rather than a private tour operator. While I enjoy going with private tours (l love the smaller group size), a new solo cruiser might benefit from a ship’s tour as it may be the easiest and quickest way to meet your shipmates. My experience, as a solo cruiser in an independent tour group, is that other ships’ passengers may be in your group. But once you’ve tried your ship’s tours as a solo, you’re definitely ready to try one of the private tour companies. This is only an observation…not a claim. My new Trivia Team aboard Holland America Koningsdam. Test your wits at trivia, sing your lungs out at karaoke, or take part in silly pool deck competitions. Chances are you’ll never see any of these people again, so have a go at something you’d never try at home. 7. Best Cruise Lines / Cruise Ships for cruising solo. Adding solo staterooms on new ships, or refurbishing older ships with a dozen or two solo cabins has become the norm. But is a smaller solo stateroom the best financial investment? Not always. It’s really important to carefully compare the total cost for a trendy solo stateroom vs. a full-size, double-occupancy stateroom. I’ve found that when you can catch a sale or a promotion, a solo cruiser can grab a full-size stateroom for less or equal to the price of a solo cabin. Be careful and don’t fall under the spell of a designated solo stateroom. There might be a better alternative. Norwegian Epic: Norwegian Epic was the first cruise ship to have an entire category dedicated to the solo cruisers. There are 128 Studio Staterooms and all are inside staterooms without a view. There’s a dedicated Studio Lounge just for solo travelers with continental breakfast, a full bar, televisions and a list of the day’s solo guests’ onboard activities. Norwegian Epic Studio Lounge for solo cruisers. Norwegian Escape and Norwegian Bliss: Almost-sister ships, each has 82 solo staterooms, all interior with a one-way window to the corridor. Norwegian Breakaway and Norwegian Getaway: Sister ship with 59 Studio Staterooms, all interior with a one-way window to the corridor. Pride of America: Four Studio Staterooms, same 99-100 square feet, all interior with a one-way window to the corridor. Ovation of the Seas and Quantum of the Seas: 28 solo staterooms Some are inside with a virtual balcony and “view”, plus some actual balcony solo staterooms. Anthem of the Seas – 26 solo staterooms, some inside with a virtual balcony, some actual balcony solo staterooms. 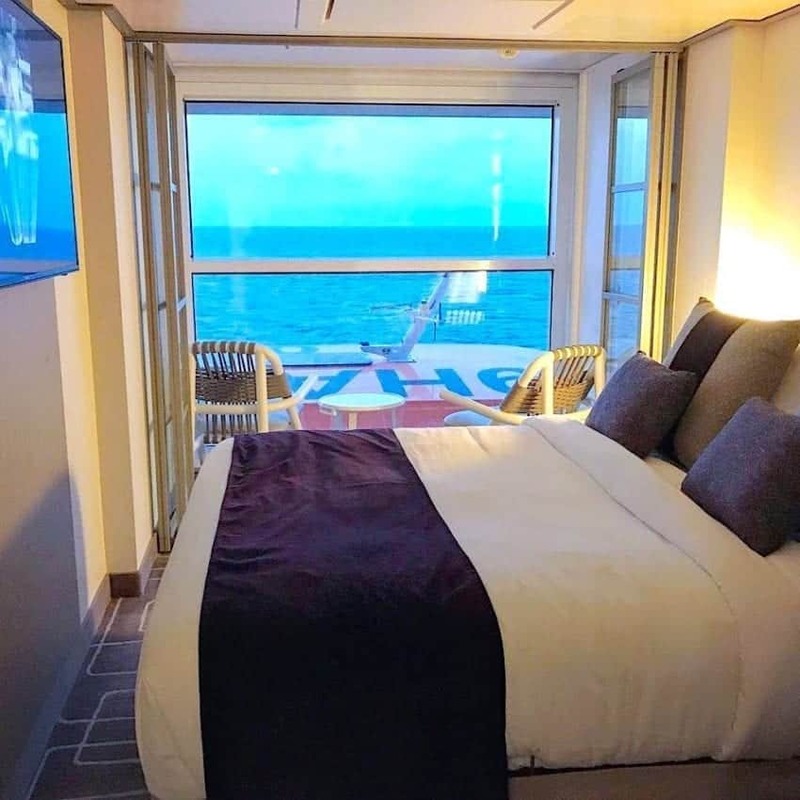 Harmony of the Seas – 15 inside and oceanview staterooms. Adventure of the Seas – Five solo staterooms, all interior. Brilliance, Jewel, Radiance and Serenade of the Seas each have three interior solo staterooms. Celebrity Edge – their new ship launched last November, Celebrity Edge has 16 solo staterooms. Four are on the lifeboat deck and 12 solo staterooms have a clear view of the ocean and Edge’s Infinite Veranda. Koningsdam – 12 oceanview solo staterooms located at the bow on the Main Deck. Nieuw Statendam – newest Holland America ship and sister to Koningsdam, it also has 12 oceanview solo staterooms Main Deck. Take a look at my review of the Holland America solo staterooms here. Cunard added 15 oceanview solo staterooms after the Queen Mary 2 “remastering” refurbishment in 2016. Queen Mary 2 solo stateroom with ocean view, on Deck 3. There are no single passenger staterooms. But throughout the year, Carnival offers slightly discounted single supplements or on rare occasions might have a few cruises where they waive the single supplement. Traveling as a solo doesn’t have to be expensive. But the cost can double due to the obnoxious single supplement that cruise lines charge a solo person in a double-occupancy stateroom. If your vacation days and itinerary are flexible, look around and find the cruise line with the lowest single supplement promotion. Depending on the time of year and if the ship is not filling up, cruise lines may slash or on very, very rare occasions, waive the usual 200% single supplement. Luxury cruise lines, like Crystal, Silversea and Seabourn offer greatly reduced or may even waive the single supplement on certain cruises. Star Clippers’ upscale masted sailing ships also have a few single occupancy staterooms and from time to time, waive the single supplement. It’s true that as a solo traveler, especially a female solo traveler, there is safety in numbers. The largest ships in the world are like mini floating cities. While you don’t have to worry about pickpockets onboard, once you step ashore you need to be aware of your surroundings. Not everyone you meet onboard may be playing with a full deck. Be careful giving out personal information like your stateroom number and home details. If your solo dinner table-mates all get chummy and decide to trade personal info for getting intouch post-cruise, don’t give out your home address! Even under the guise of sending holiday and Christmas cards, don’t do it. Instead, before your cruise, set up a new email account that you use only for people you meet on your travels. When your ship is docked late in a port and you plan to spend an evening at a popular bar, maybe a Carlos and Charlie’s or Señor Frog, think of a plan as to how you’ll return to the ship late at night. Watch for a group of cruise-people that are walking back to their ship and tag along. Stay with the group and don’t straggle. In many ports, where English is not the primary language, a taxi ride especially at night can be a challenge. If you plan to take a taxi back to the ship, have the port address and ship name clearly written to show to the driver, in the local language. You could even draw a picture of the ship. Once in Lisbon after a night of Fado and dinner, I and two shipmates stepped into a taxi only to learn that the driver didn’t speak English. When communications broke down and since we hadn’t yet even closed the taxi door, we jumped away from the cab. Suddenly, the driver gets out and starts screaming at us to pay him. We hadn’t gone anywhere! When two of his burly buddies approached out of nowhere, my friends and I literally ran into a nearby restaurant to wait until they were gone. A word to the wise: be careful with late night taxis in foreign countries. Can you imagine this same scenario if you were a solo female traveler? Dining solo on a cruise – Bonus Tip! Here’s your dilemma: early or late seating, open seating, large table, small table, dine alone, food court, specialty restaurant. Whew. So many choices. What’s a solo guest to do? On some cruise lines, the maître d’ or a computer matches solo passengers to dine together. Occasionally, though, I’ve been seated at a table for ten where I was the only non-coupled diner. Once on formal night, though, I was the only one who showed up. No one said that they were all going to different specialty restaurants. I immediately asked the head waiter for a table for one. He escorted me to a wonderful little table. This became “my” table for the duration of the cruise and was a highlight of my trip. My worst nightmare occurred when I was seated with one couple and another solo passenger. I had nothing in common with any of them, requested a table change after dinner and spent the rest of the cruise avoiding them at every turn. Early (or main) seating generally attracts an older or family crowd. Late dining is great, especially if you like to spend time in port until the gangway is hauled in. With late seating, you don’t have to scurry back to your room, shower/change and rush to the dining room. This is especially important on a European cruise. Hungry? Get a snack to tide you over until 8:30PM. If you’re tired of making idle chatter with total strangers night after night (this is common on the “open” seating options) or just want to reflect on your day, opt for the food court or specialty dining. For the food court option, I’d suggest bringing a book, laptop or some other object to stake out your solo table. Otherwise, you are left to your own devices to juggle a tray, beverage and your book while wandering aimlessly to find a table. I think that dining alone at a specialty restaurant is a delight. You’ve paid for the experience so getting a solo table is easy. The wait staff is also super-attentive and eager to make this a positive experience. I just don’t like it when the waitperson removes the extra place setting. There’s no reason not to enjoy your solo cruise dining experience. If it isn’t wonderful one night…simply move on to another option for the next evening. Once you go, you know. Solo cruising can become addictive. Do what you want when you want, dine anywhere at any time and use up all the closet space for yourself. Explore places you might never have seen if you hadn’t taken a solo cruise. You’re empowered. Please PIN to share with other solo travelers! A 22-night Med cruise!! Wow. That will be wonderful! And good for you going solo. On a 22-night cruise, I would expect 3-4 “formal” nights. I used quotes because formal isn’t as it used to be a few years ago. You don’t need a tux (but some men will bring one just because). There will be scheduled solo traveler meet and greets; maybe late-morning coffee, afternoon tea, happy hour, etc. For dining, I would definitely go with assigned dining time if possible (and if you don’t mind…late seating for Europe is best). Make sure that you request a large table for solos/singles on your reservation – either ask your travel agent to do it or DIY if you didn’t use a travel agent. Once onboard, check with the maitre’d that you’ve been assigned to a solos’ table. And if you don’t like your tablemates, you can quietly ask the maitre’d after dinner to change your table. You could also check with the maitre’d and ask if there are any solo tables on the Anytime dining. Sometimes that is possible too. But a lot of Anytime solo diners tend to move around a bit so a sense of getting to know people at your table diminishes with Anytime dining, generally speaking. I’ve also met future tablemates while we were on shore excursions where we’ve clicked and decided to all meet up to dine together. Either way, remember you can always talk to the maitre’d and let him know what you prefer. There will be a brief window to speak with the maitre’d who will be stationed in front of one of the dining room entryways most likely right after muster. If not, on your way out of the dining room after dinner is also a good time. Have a fabulous time! October is my favorite time for a Med cruise. Less tourists and if you’re lucky there’ll be beautiful warm, sunny weather. Thank you for the information on solo travel. It’s great insight as to what to expect when I’m onboard. I’m going on a 22 day Princess cruise to the Mediterranean October 2019 and I’m going solo. I like to think I’m outgoing so I don’t anticipate a problem making new friends. I’ve never been on a cruise before so I’m not sure what to expect as far as onboard activities go. There isn’t a lot of info on that and also it’s a guessing game to when formal nights are. I’ve got a “club class” minisuite booked with anytime dining and I’m apprehensive about finding dining mates. I’m considering changing my anytime dining to assigned seating to compensate the situation. Thank you for your comment. Glad that you found the cruise tips to be helpful. We fell in love with cruising too since our very first Malaysia cruise. Since then, we have travelled 4 times with Princess Cruises and have been sharing our experiences in our blog. Thank you so much for your wonderful note. It’s been ages since we’ve met up on a cruise…I think it was Norwegian Sky? Your upcoming adventure sounds fantastic and a solo opportunity that you’ll always remember! I appreciate your subscribing to my newsletter, too. Have a wonderful trip! Please email me when you return…I’d love to get your cruise report to publish here, if you wanted to do it. I admire you so much… I tell the world about you… I am getting ready to do an 25 day Antarctica cruise & tour in S. America in November..I am really glad that no one wanted to go with me…and really looking forward to it. I do travel solo but have not done such an extensive trip solo…I love keeping up with you, and hope that our paths cross again one day soon..
Congratulations on cruising solo! Yes, I would just plan on giving the upfront $20 the first time only. Before you settle on a particular bar, please do a good walk-around until you feel like you’ve found your “Cheers”. If you find that you’re getting generous pours and excellent service, at the end of the cruise you can always give a few dollars extra. Not necessary at all, though. Have a wonderful next solo cruise! Thank you for reading and sending your question. Hi Sherry…I have actually traveled quite a bit but just started traveling solo this year. I love cruising and will take your advise about smiling (such a simple thing that makes so much difference). I like the bar idea and will definitely try it. That $20 is just the first time right ? Taking an on-board class would be such a fun activity! It would help to not only get you involved, but it would also help you to meet new people! That way you can try and make some friends while on the cruise, and it will make your time more enjoyable there!